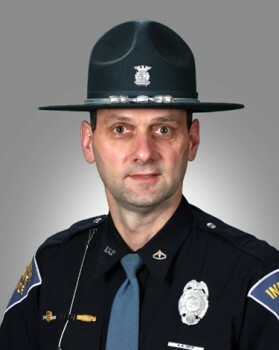 FORT WAYNE — Indiana State Police Superintendent Douglas G. Carter has announced the promotion of Sgt. Kevin W. Smith to the rank of First Sergeant within the Field Investigation Section to serve as the District Investigative Commander for the Fort Wayne Post. Smith is a native of Syracuse, and a 1983 graduate of Wawasee High School. On Dec. 19, 1987, he graduated from the 45th Indiana State Police Recruit Academy as a trooper and was assigned to the Toll Road Post where he spent three years working LaGrange and Steuben counties. In 1990, Smith transferred to the Fort Wayne Post and was assigned patrol duties in Steuben County. He transferred to the Laboratory Division in 1995 where he served as a Crime Scene Technician for two years and in 1996, earned a bachelor degree in criminal justice from Indiana University Purdue University Indianapolis. In 2005, he was transferred to the Criminal Investigation Division where he served as a detective until his promotion to sergeant in November of 2015, which had him overseeing the day-to-day investigative duties of seven detectives assigned to the Fort Wayne Post. Smith’s new duties will have him supervising the Investigative Squad Leader, being a liaison between criminal justice agencies within the district, identifying crime problems and actions plans, and reviewing criminal case and incident reports generated by troopers and detectives from the Fort Wayne post. During his career, Smith has served as a field training officer, a member of the Tactical Intervention Platoon and in October of this year, he was awarded the department’s Meritorious Service Award for his investigative efforts into a “cold case” homicide from 1989 in which the suspect was ultimately located in Bangladesh and finally arrested in India. The suspect, Mahfuz Huq, was extradited back to Indiana in 2013 and he pleaded guilty to manslaughter that following November. Smith and his family are residents of Steuben County, where he has resided for the entirety of his 28 year career.